Firestorm is a big ball of fur. He has short grey hair all over himself, except his paws. Firestorm`s paws are a light white color.His paws have long white hair, which make him look cute. Has you will remark, Firestorm has two different eye color. One of his eye is a kind off golden color and the other is a blue ocean color, which makes him unique. Firestorm is a cold hearted cat. He doesn`t care about others or even himself. Firestorm doesn`t really like to start a conversation, instead he tries to run away from it. For some reasons, he prefers being on his own. Being with other wolves gets him nervous. Firestorm is grumpy at times. Although he isn`t a so frinedly cat, Firestorm is a very loyal cat. You can always count on him. He sometimes can loose patiences quickly, but he cant help it. Firestorm is a smart cat that is ready to help his pack members if he needs him, but never count on him too smile or even be friendly. Born in a small group that barely had members, Firestorm, the grey and white cat was a happy small kit. He had a small sister which he loved more than anything else in the world: Miala. Miala was a bit younger then him, but not that much. Both of the kittens played together, and would never fight, they were just like best friends. Firestorm would always protect Miala no matter what. Maila and Firestorm walked into the woods happily enjoying life. "Stay here, i have a surprise.." Maila told Firestorm. Firestorm sat down. "And close your eyes." she pointed out. Firestorm did what he was told, he closed his eyes smiling a bit wondering about the surprise. After what seemed for a while, the kitten opened his eyes. He started walking around the woods trying to find Maila. "MAILA, MAILA!" 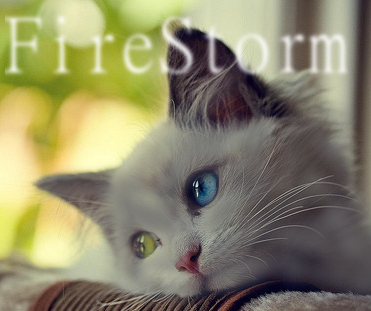 Firestorm cried out loud worrying that something horrible had happened to her. Soon it became night and Firestorm was continuing to search for Maila desperately. As he walked quickly he soon saw a white cat in the water. It was Maila. Firestorm ran has fast as he could and pulled Maila out of the water. He picked her up and put her on his back. Firestorm walked quickly back to his group which a healer checked Maila. Firestorm was waiting outside the den crying about this all being his fault. The healer soon got out of the den and looked at Firestorm. "I'm sorry.." the healer said. Tears rolled down Firestorm`s eyes. Loosing his sister was like the end of the world. Firestorm hadn't been there quick enough to save her. Instead of explaining what happened to Maila to his parents, he decided that his solution would be running away, so he did. While getting older Firestorm went in another group, which he soon got kicked out. That's when he made his way to ThunderClan, which he hopes will be the perfect place for him. OK Looks mostly good, except you refer to Snowpaw as a wolf/pup several times; and I am unclear -he lived in another Clan until Maila died, then he went to ThunderClan? Also, 'paw' is the suffix of an apprentice. You can call him Snowfoot, if he is a warrior. Snow'paw' would be an apprentice. Thank you.